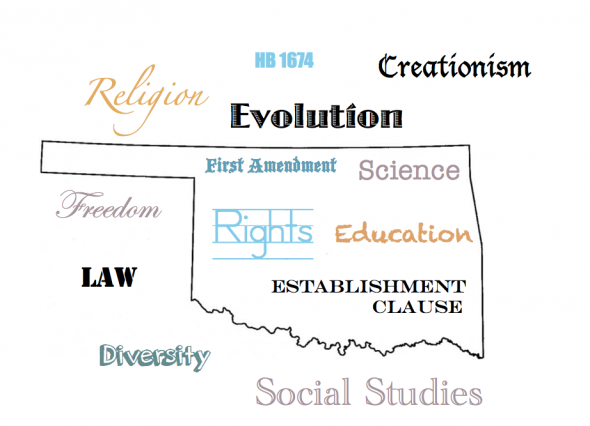 Despite what politicians like Rep. Gus Blackwell think, he’s the guy who introduced House Bill 1674 which would allow educators to discuss creationism as a counterpoint to evolution, it is illegal to push your religion in public school classrooms. It violates the Establishment Clause of the First Amendment. And a few Oklahoma schools have had to be reminded of this recently when teachers decided to take it upon themselves to proselytize in the classroom. One example that has made the news is a case from Wynnewood Middle School. The sixth-grade social studies teacher at Wynnewood decided to turn her classroom into a sermon, including pronouncements on the efficacy of evolution. Some of the parents heard about this, and were justifiably upset. After striking out with the administration, concerned parents contacted the Freedom From Religion Foundation (FFRF), a national nonprofit that advocates on behalf of separation of church and state. The FFRF is basically the go-to organization for this kind of thing. The ACLU will assist in landmark cases, but the FFRF are really the folks in the trenches helping enforce settled case law on evolution, school prayer, teachers pushing their religion, etc. They don’t get as much hate in the media, because they don’t have a high profile, are more narrowly focused, and are a younger organization. Given enough time, however, and you’ll likely hear theocratic politicians spitting out “FFRF” like a curse word too. As soon as the FFRF found out about the problems at Wynnewood, they acted. According to a statement on their website, FFRF Staff Attorney Andrew Seidel sent a letter to the school, letting them know these violations are not to be tolerated. “…It is our information that a WMS social studies teacher, Mrs. Carter, is using her public school classroom to inculcate her students into a particular religion. We understand that Carter frequently discusses Christianity with her students under the guise of world religions. We understand that she does not discuss Christianity in an objective manner as required by the law. We understand that she repeated egregious falsehoods to students, including that the U.S. Constitution was taken directly from the bible–that this is coming from a social studies teacher is all the more alarming. We understand that Carter also attacks evolution in her classroom. Apparently, Mrs. Carter is married to the principal, and there have been other incidents. The rest of the letter cites a bunch of case law explaining in detail how the teacher, and by extension the school, is in violation of the constitution. This is the point where Superintendent Raymond Cole is supposed to write back immediately explaining that he understands the implications of the letter and is taking appropriate actions. Do you think that is what happened? It’s a small town in rural Oklahoma. These guys aren’t used to actually dealing with people who call them out for blatantly forcing their views on others. Cole did write back, and he admit that the teacher shouldn’t have had the posters up. Then he proceeded to proselytize and argue against evolution. Mind you, this is exactly what he should be explaining to his staff NOT to do. “I respect people who stand for what they believe in, although I dont really know what you believe in I only know what you dont believe in. Out of curiosity, I would like to ask you what you believe and I’m honestly not trying to be argumentative ( it would be foolish to argue with a lawyer) I’m honestly interested in your views. If you believe in evolution, why did we stop evolving? I mean, people are generally larger today than 2000 years or millions of years ago, but we haven’t lost a toe or little finger, etc. What happens when you die, if you’re wrong? If I’m wrong, when I did I just die, but you’re wrong, when you die…. I have a degree in science and I’ll admit some things are were very confusing, or hard to understand, but in the end my faith in God forms my belief. I have seen God work in my life and I truly feel his presence. There have been many times in my life where I have fallen short but I know in my heart that God loves me and forgives my short comings, or sins. I dont [don’t] want to just to any conclusions, perhaps you and many of your group are Christians and are just trying to keep Church and State separate. I would submit that the single greatest reason for the violence in our schools today is this so called separation, and that the further we separate God from our schools the nearer we bring violence and evil. I’m telling you things in this e-mail that I DO NOT share with students because I try to obey the law even if I dont [don’t] agree with a particular law. I think teaching students to be good citizens is our greatest responsibility and obeying the law is part of good citizenship. I would submit that Raymond Cole might have benefited from running that letter past the school district’s attorney before he hit the send button. “There is evidence that humans have evolved in the last several thousand years and continue to evolve. Analysis of variation in the human genome indicates that genes associated with brain size have evolved over approximately the last 37,000 years and 5800 years (Evans et al. 2005; Mekel-Bobrov et al. 2005). Sickle-cell resistance has evolved to be more prevalent in areas where malaria is more common. Lactose tolerance has evolved in conjunction with cultural changes in dairy consumption (Durham 1992). Some humans have recently acquired mutations which confer resistance to AIDS (Dean et al. 1996; Sullivan et al. 2001) and to heart disease (Long 1994; Weisgraber et al. 1983). As for Cole’s claim that separation of church and state is the main cause of violence in our schools, I submit that the court decisions of the last few decades that have bolstered the wall of separation have coincided with a massive decrease in violence in schools. Of course, I’m not silly enough to claim that there is any causal relationship between the two. Steven Pinker thinks the decrease in violence across the board in America and around the world is complicated enough to write an 800-page book about, so I’m not going to posit those kinds of simplistic explanations. “Please understand that my personal beliefs have no bearing on the illegality of the Carters’ actions. But since you asked, I believe in the First Amendment. I believe in protecting minorities from the tyranny of the majority. I believe that religion is the single most divisive force on this planet and that it has no place in our public schools. I believe that ideas should be subjected to reason, debate, and inquiry, not blindly accepted. I believe that a public education is the key to a successful country because a democracy only works if the electorate is informed and educated. According to Hemant Mehta over at the Friendly Atheist blog, Cole has written back one last time. “I assure you I will continue to monitor this situation. I do not encourage teachers to promote any religion in their classrooms nor do we have any student lead prayer at any of our functions. I agree with your assertion that morality does not require religion. Cole also sent out an email to his principals. Please have a teachers meeting ASAP, no later than Friday morning. At this meeting reiterate to the teachers that they are not to promote any religion in their classrooms. It looks like Superintendent Cole might have done the smart thing and talked to the school attorney after all. Don’t think this kind of thing only happens in small rural towns like Wynnewood. I’m currently following another FFRF intervention in a public school in a metro area suburb. The parents of the student have contacted the FFRF, and so far, things have gone well. The FFRF hasn’t had to publicly address anyone. That’s probably the biggest difference between the large and small school superintendents. The large school ones are more aware of these issues and don’t send out reactionary emails before they talk to the school attorney. It is worth noting that this is occurring in a suburb, and not inside of one of the Oklahoma City public schools. There are some clear advantages to living in the more urban areas. The schools are used to accommodating minority religious viewpoints. I know some teachers in Oklahoma City, and they all have students from a wide variety of religious backgrounds. A teacher that tried to push his or her religious views in the classroom would not get very far with parents or administrators. Thus in these situations, the FFRF need never get involved. As soon as a parent brought it to an administrator’s attention, the problem would likely have been solved. If you are a parent raising a child in a household with minority religious viewpoints, or you just care about the First Amendment, keep the FFRF in mind, and don’t hesitate to use them if school administrators aren’t helpful in resolving an issue. The FFRF get’s results, and they won’t out you or your child to the school or the public. Tagged Africa, ASAP, atheist, creationism, evolution, FFRF, First Amendment, Friday, oklahoma, Oklahoma City, Superintendent Cole, WMS. Bookmark the permalink.